The MIG·O·MAT plasmaJET 100SPS is specially designed for automatic and robot welding systems. Equipped with a modular based Siemens SPC control device the plasmaJET unit offer an easy operation and a high degree of process safety and flexibility, so that huge number of special customer requirements and adaptions can be realized. The integrated high-performance cooling system with monitoring of the coolant flow-rate is designed for the high demands of the plasma welding process and in particular the plasma welding torch. 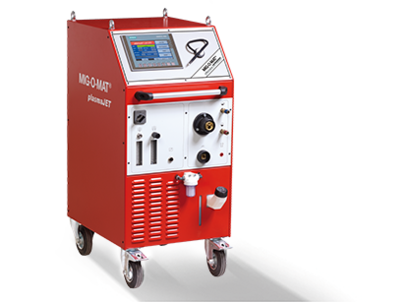 The MIG·O·MAT plasmaJET 100SPS is especially designed to meet the high demands of the microplasma welding process, where even lowest welding current, a precise adjustability and regulation and an excellent reaction of the plasma-arc are of vital importance. For a simple handling, the display can be demounted from the welding unit and it can be integrated into the customers control desk*.